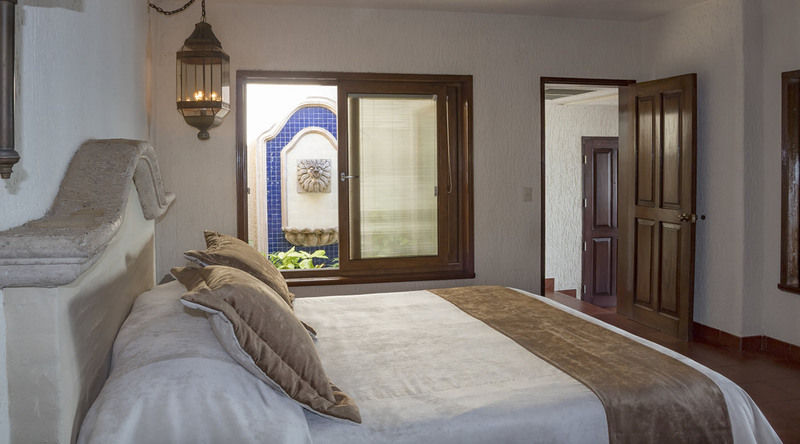 Here in Cielito Lindo, the charm and allure of Old Mexico can be found. Brick handiwork circles the ceiling of the bright, spacious Living Room, and a brick-and-tile boveda, or cupola, rises above the dining room table. Colorful tile work accents and a bubbling fountain in the private patio off the master bedroom is reminiscent of days gone by. Old meets new in the master bath, built completely of traditional Mexican blue-and-white tile, sits beneath another brick boveda that leads to a round skylight. 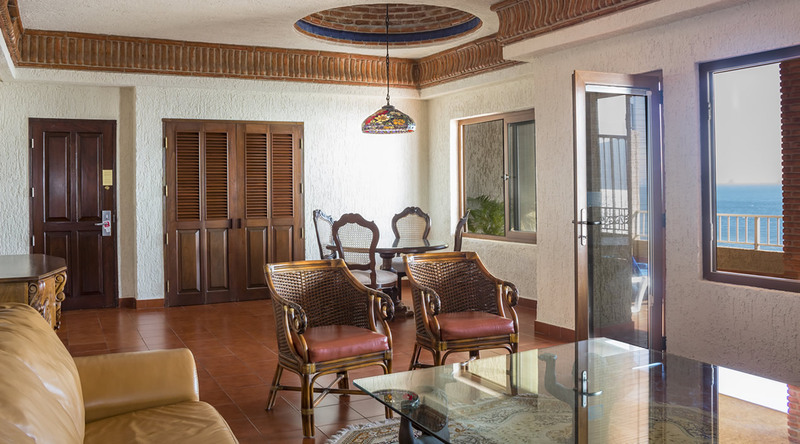 Throughout the suite, the Pacific Ocean can be seen shimmering through wraparound windows, and a balcony outside the living room is perfect for sunset and beach watching. Of course, we’ve included all the modern conveniences you might need, too: flat-screen TV, wireless Internet, leather couches, hand-made, one-of-a-kind wood furniture, comfy king-size bed, small fridge, microwave, sink, coffee maker and more. Cielito Lindo at the Hotel Playa Mazatlan is the perfect place for a honeymoon, or for couples looking for a beautiful place to rediscover their love. Families can enjoy this unit as well, by adding an adjoining second bedroom and bath (additional charge). 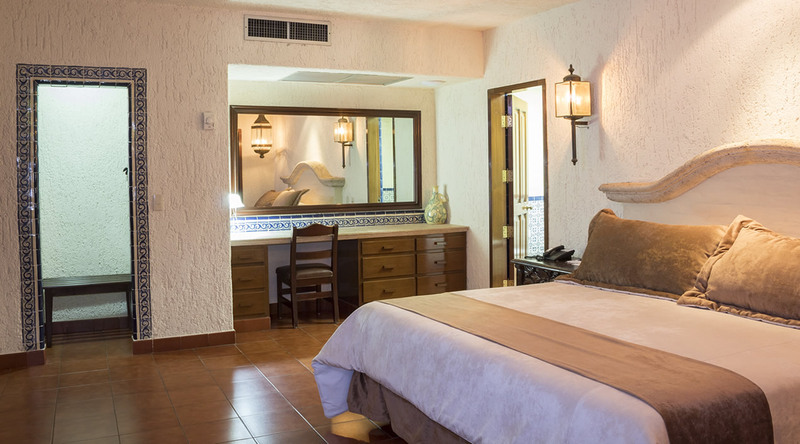 The Playa Mazatlan Beach Hotel has 400 rooms available for your lodging needs with a variety of options. 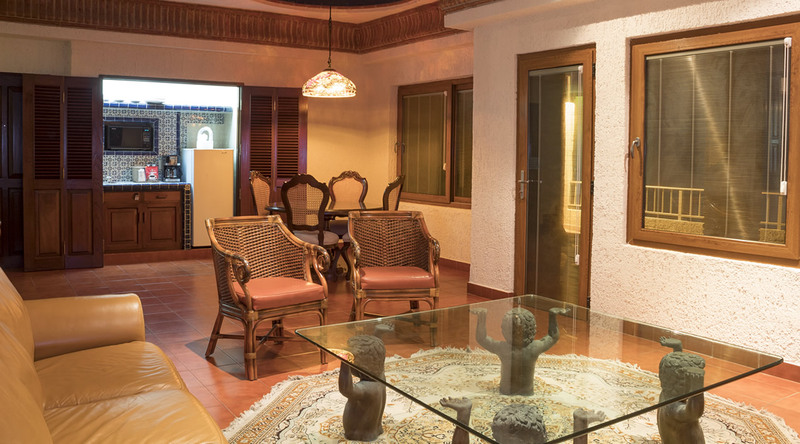 Such as: Standard rooms, Garden View rooms, Ocean Front rooms, Junior Suites, Deluxe rooms, Penthouse Suites and multiple choices for adjoining rooms suitable for families and groups of all sizes. Book Now and choose between daily buffet breakfast for Adults or daily food & beverage credit. Our 24 hr All Inclusive Plan will allow you to enjoy to the maximum the opportunity of being a guest. This Plan includes: breakfast, lunch, dinner, national and imported beverages, in any of our fantastic 4 Restaurants, Snacks, Cevicheria, Coffee Shop, Sports bar, Swimup Bar, 4 Bars, Themed Show Buffet, 5 Swimming Pools, 4 Jacuzzis, Cenote (Grotto Pool), Kid’s Club, Fitness Center and Spa. * Price based on single or double occupancy. Price will vary depending on season and room category. Price subject to change without prior notice. You can’t use this promotion in conjunction with any other. One infant free per adult. Maximum of two infants free per room (Infant: 0 to 6 years old). BREAKFAST BUFFET (daily only for Adults or Juniors staying in the room). Available only if you book directly with us from March – April 12 & April 28 – June 30, 2019. FOOD & BEVERAGE CREDIT applied nightly “Upon Availability”. Excess credit balances are not carried forward. Credit not valid on day of departure. Guest who do not open credit with the hotel are not elegible for this credit. When booking please specify the choice of your preference. KIDS FREE 1 Kid Free per paying adult. Maximum of 2 kids free per room. Available only if you book directly with us from March to April 12, 2019! **** Your refrigerator will be restocked daily with 4 beers, 4 sodas and 4 bottles of water, except day of departure. When checking into the hotel, you’ll need to present proof that you are the person who made the reservation and that you are over eighteen years of age. This can be anything from a driver’s license to a state ID card or passport. Requiring an ID for check-in is a way to make sure that only registered, paid guests are admitted to hotel rooms, and prevents strangers or criminals from compromising the personal safety of those staying in the hotel.